PORTSMOUTH, Va. (WAVY) -- One of the most iconic photos of the 20th century is recreated with a twist. A sailor and his husband posed for their own version of the "Kissing Sailor" at a homecoming in Florida. The couple in the viral couple have strong ties to Hampton Roads. 10 On Your Side spoke with Bryan and Ken Woodington. Bryan, a Navy sailor, grew up in Suffolk and Hampton and also attended Old Dominion University. The Navy sent him to Florida, where he met his husband Ken. The two married on December 15, 2017, before Bryan shipped off for a seven month deployment on the USS The Sullivans. On board the ship was a print of the iconic "Kissing Sailor" from V-J Day in Times Square. 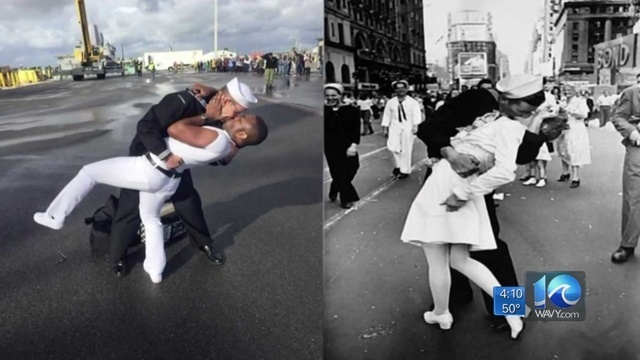 The recreated "Kissing Sailor" photo (left) and original from V-J Day. "I wanted to recreate that picture because I thought it was beautiful," said Bryan. When Bryan returned home December 21 he wore his winter blues and Ken wore all white. "He ran to me and he grabbed me and he put his arms around me like a bear hug and I couldn't get him off me, I couldn't pry him off and he was crying and he was so happy," said Bryan, remembering the moment. Then they kissed and the photo taken went viral, even making international news. The couple says they never expected the photo to go viral like it has. Not all the reaction has been positive, however Ken Woodington says the good outweighs the bad. "I'm happy that people get to see the love that we have for each other and it's just showing two people that are in love, and it shows how much we miss each other and the other part is you know again we've all seen the negative comments about it and it's just as serious as people are making it out to be, but I love that it's showing two people who are in love. With a hint of serendipity, the sailor who was in the original photo, George Mendonsa, was on leave from the first USS The Sullivans during the iconic kiss. In light of the backlash from some corners of the internet -- the Woodingtons say the Navy has been nothing but positive and supportive.